Class is taught by Cyndi and Kathryn. This class is a full of fun, playful partner poses to uplift and invigorate your and you partner followed by relaxation bliss to end the class. Learn to connect, breathe and flow. This prenatal yoga teacher training prepares teachers to guide pregnant students through the journey of motherhood, from conception, through three trimesters and into postpartum. Detailed presentations on benefits and contraindications for yoga practice during pregnancy and postpartum. 18 hours of classes focused on practice and thorough presentation of the asanas and the appropriate use of props to support the pregnant body. How to start a prenatal class. Be prepared for THE MOST unbelievable experience of your life. It is truly amazing. A Somatic Sound Bath is a unique and powerful experience, combsound bath. Sounds produced by singing bowls, the voice along with other instruments become tools for weaving restorative yoga asana, vocal toning and a tapestry that yolks the mind to the body and individual to the collective. 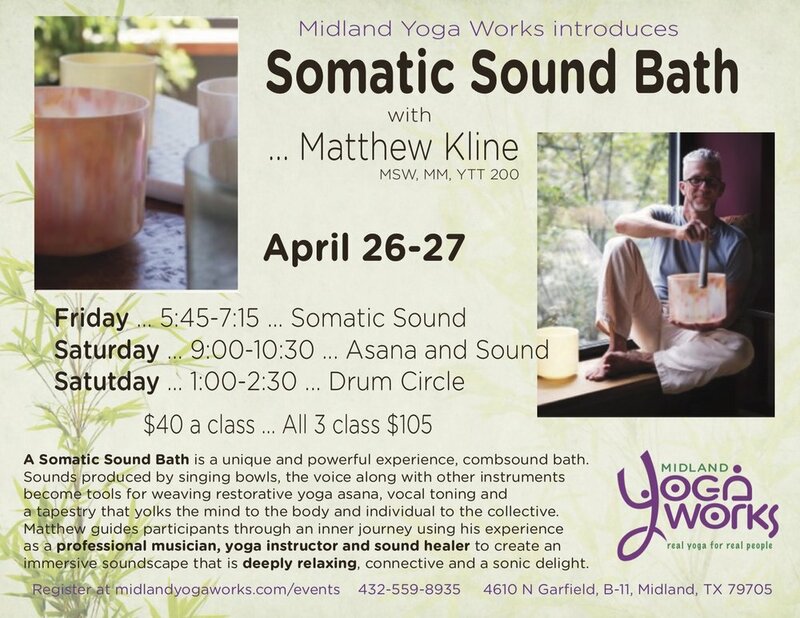 Matthew guides participants through an inner journey using his experience as a professional musician, yoga instructor and sound healer to create an immersive soundscape that is deeply relaxing, connective and a sonic delight. Don’t miss this amazing teacher as she leads us in a fabulous workshop. It is so worth it! I promise! Through asana, chanting, and pranayama, we will explore the unifying experience for body, breath, and mind. 9:00 and 10:15 Classes combine for a fun Christmas Vinyasa Classes with multiple instructors sharing their sequences and a special Christmas playlist created for this class. There will be fabulous sugar cookies and something to drink and of course, juices from the juice bar for after class. We want to THANK you for a great year. All Saturday classes are FREE. Space is limited, so sign up!!! Linda is one of our FAVORITES! We love every time Linda hops on a plane from Santa Fe!! And you will, too. Don’t miss this special weekend in October with our dear friend. Saturday morning classes are free. Space is limited so please sign up. 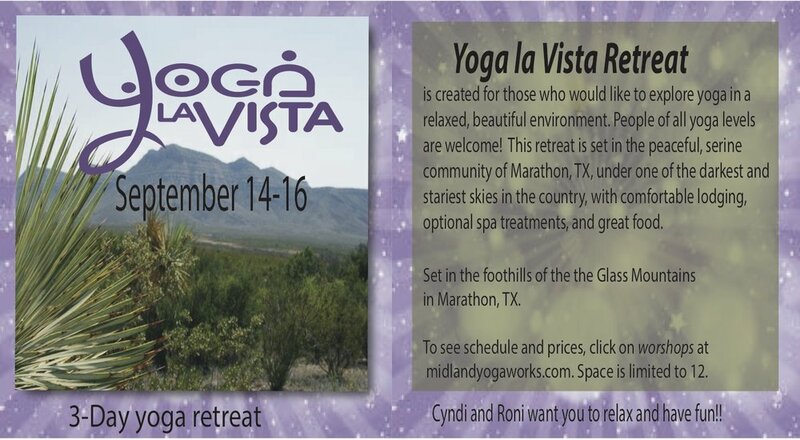 Yoga la Vista Retreat is created for those who would like to explore yoga in a relaxed, beautiful environment. People of all yoga levels are welcome! This retreat is set in the peaceful, serine community under one of the darkest and stariest skies in the country, with comfortable lodging, optional spa treatments and home cooked food. Arunji is a master teacher with a light approach to a serious, sacred subject. His infectious humor, understanding of the philosophy and practice of Yoga instills in each student a desire for more. Attend the sessions that fit your schedule. Join Synda for a Mala Meditation from 10:30-11:30 on Saturday, June 9. Making your own mala and learning a "counted meditation" is part of this meditation class. Prenatal yoga focuses on poses for pregnant women, in order to increase strength and flexibility. It also helps pregnant women to develop proper breathing and relaxation techniques for easier and more comfortable labor. Shopping ... 25-75% off all retail ... leggings, tops, jackets, mats, candles ... all retail.